Dear friends: I left Portugal on March 6, 2019 and arrived in Ethiopia on March 6, 2011. I am now younger. Thanks to everyone for your expressions of affection and friendship. In my prayers I keep myself in the heart of God, because He, who loves us all and each one of us in particular, knows what is best for each of us. This is why I am in Ethiopia. Because he, who loves me, knows what is best for me. I do not know for how long. I only know that I am here and each day is a new adventure, a sincere desire to live my mission where he sent me. I am fine! Even better, I am happy! I am at the provincial house of the MCCJ of Ethiopia in Addis Ababa. This will be my home over the next few months while studying Amharic. Amharic is a difficult language. But, by the grace of God, up to now I have not yet fallen into the temptation of discouragement. I am strengthened by the desire to stay close to people, speak with them, be in communion. And, unless you know Amharic, this is almost impossible or totally impossible. I love Ethiopia. I know that I will find difficult and hard moments of doubt and despair. But right now I am in love. And I want to live this moment intensely, because it is unique. I live in community with the MCCJ in Addis Ababa and I feel part of it. From the beginning they welcomed me in a wonderful way. Our days begin with the Eucharist and Lauds at 6:30. After breakfast, I go to school, which starts at 8:30 and ends at 12:00 noon. After lunch, I start studying. At 6:45 PM we pray Vespers and, after supper, we usually have some time together. The house is almost always full, since many missionaries traveling in Africa come through here. I was already able to meet some priests and even some bishops. I have already heard some beautiful and frightening stories. How hard is the mission sometimes… But always beautiful. Our lives are in the hands of God. I already had the opportunity to be in Hawassa for a few days with the CLM stationed there. How nice it was. We even had a cake to celebrate my visit. In formation we learn that we must always have a good reception of the new CLM. And truly, to receive this warm reception and affection is in fact, extraordinary. 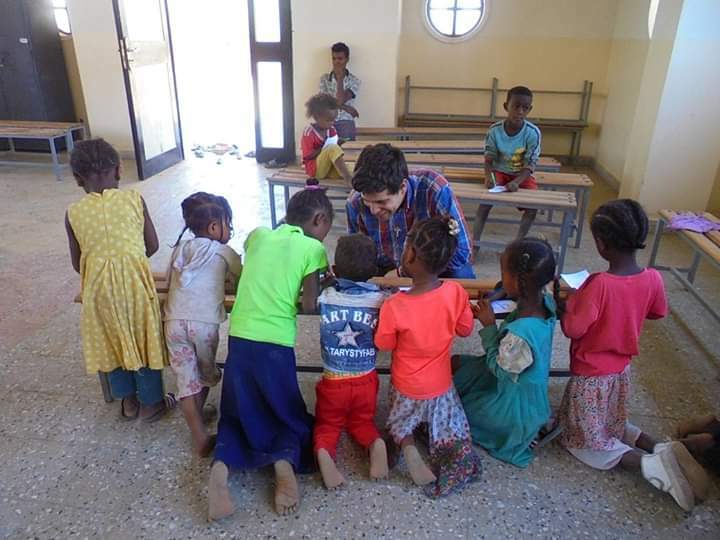 For this, I am very grateful to the CLM in Ethiopia. In Hawassa, during a bicycle ride, I pinched both tires. It was a good baptism. 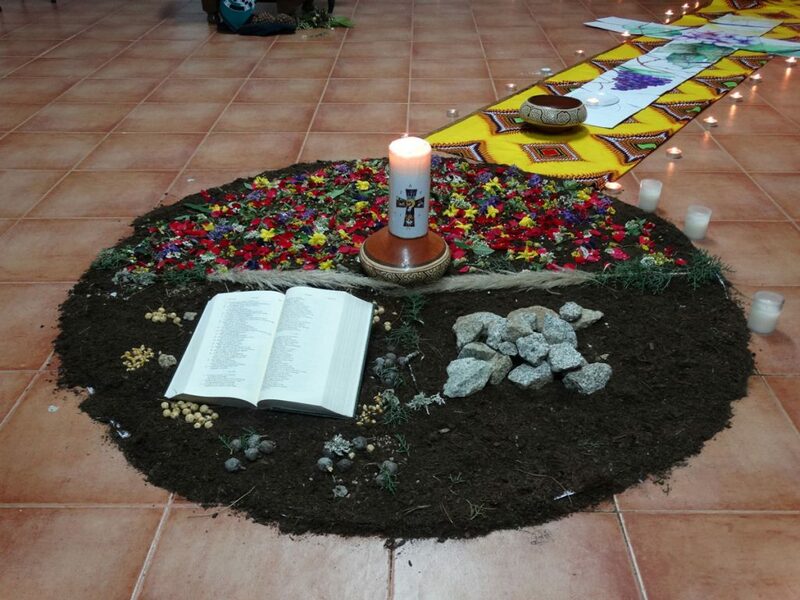 This weekend I attended a retreat of Comboni Friends. It was very good. 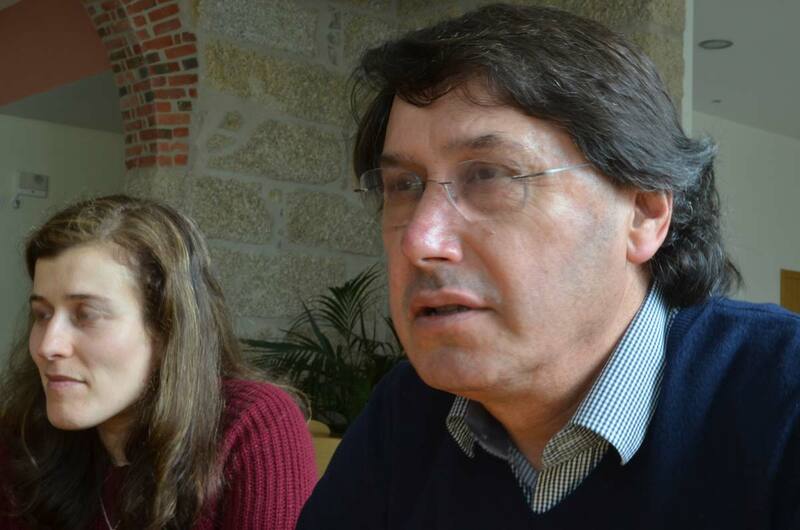 Here the celebration of Easter will take place a week after the celebration of Easter in Portugal. Taking advantage of a week’s vacation, I will go visit the mission among the Gumuz, the people with whom, God willing, I will work. I am enthused. Later I will let you know how it went. To all of you and your families I wish a holy Easter and o not forget that God loves us. Let us keep united in the love of God. April 2, 2019 Fr. 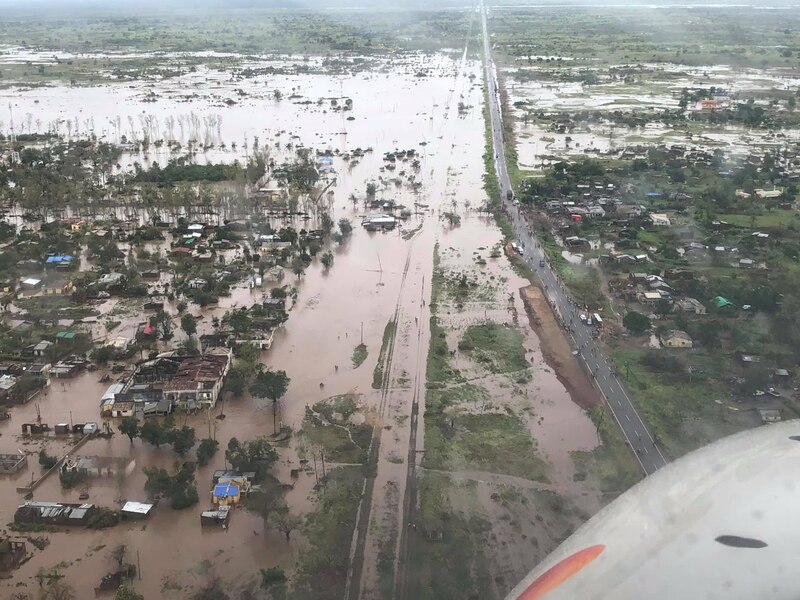 Constantino Bogaio, Provincial of the Comboni Missionaries in Mozambique, tells us about the current situation after the destruction caused by the Cyclone Idai. 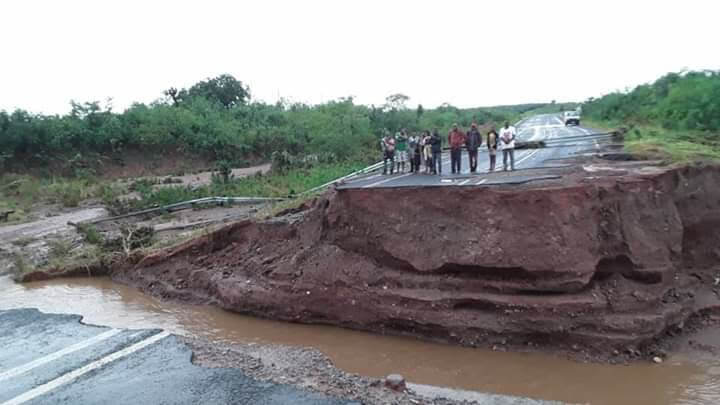 The arrival of Cyclone Idai, with winds reaching 120 to 220 kmph and vry heavy rain, left in the city of Beira and its surroundings a trail of destruction never seehn or experienced before in the history of Mozambique. In a short time the city was left deserted, ghostly, in a desolate situation. Walking through the avenues, the streets, the roadways one could see the houses destroyed, hospitals torn apart, the ruins of the churches, fallen trees, light and telephone poles thrown here and there. The city of Chiveve had a blackout that affected 95% of its buildings, except for the airport that was turned into a shelter for the locals and for the foreigners arriving to help. 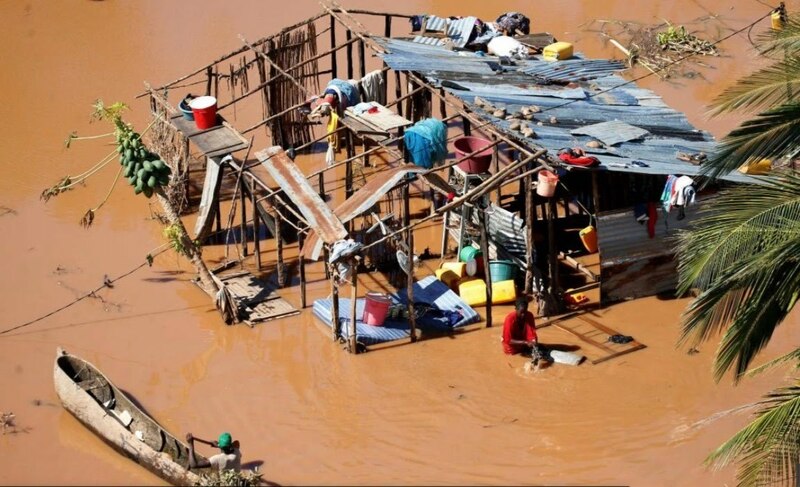 In neighborhoods such as Munhava, Muchatazine, Vaz, Chota, Ndunda and others, besides the destruction of homes, there was extended flooding. While the second city of the country was beginning to estimate the damage done by the cyclone and raise from its wounded pride, it started to receive bad news reaching one bit at the time, because the only land connection was cut off by the fury of the waters of the rivers Pungue, Búzi and Muda and their tributaries that flooded over their banks in the district of Dondo, Búzi, Nhamatanda, and Chibabava in the province of Sofala. This is the only land connection between Beira and the other cities. Thus the suffering of the people became even worse. For almost a week they were almost totally isolated on the ground. Basic products were getting scarce and the constat rain made people’s lives very miserable. The international community, arrived to give help, chose as its top priority to save lives in the surrounding districts, moving people to Beira. Thus a number of shelters were set up around the city. We must emphasize that no one knows the exact numbers: Classrooms destroyed: 3140 Students affected: 90,756 Homes destroyed: 19,730 Dead: The dad in these areas are more than 500, but the numbers of missing people is not yet known. In the city of Beira we work in the suburb of Chota where more than 70 thousand people live. At the moment, 270 families had their homes destroyed and we have 170 families in immediate need of support, food and other necessities. So, in this first phase, our job will be to support these people. The second phase will be to rebuild the homes, build a school as well as a youth center in the parish so that children and young people will have activities, because what was there before was built of wood and clay and the cyclone destroyed it completely. We want to build this youth center to give hope to the children, adolescents and young people who survived, but it must be a solid and resistant structure. We also want to create a support group for the mothers for health and nutritional education. 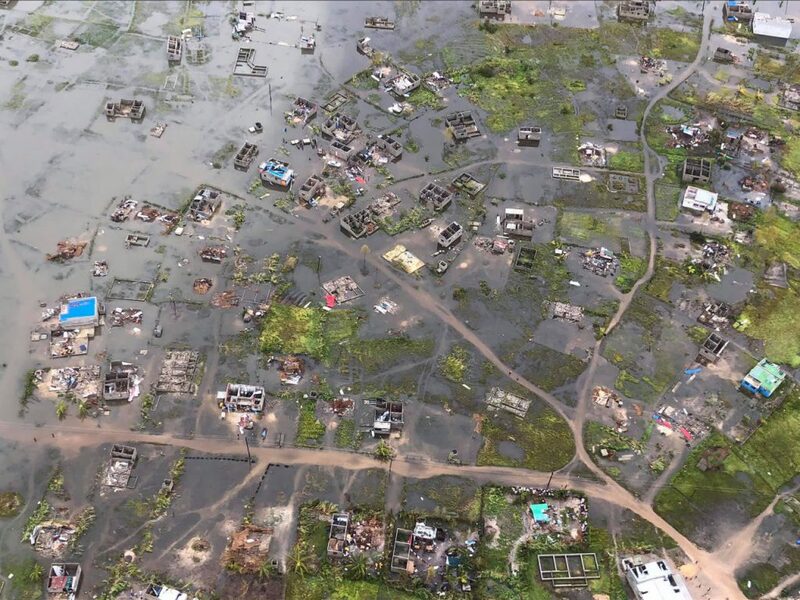 The area of Chota is the continuation of the largest neighborhood of Beira which is currently already being attacked by cholera. There are rumors of 200 people already ill, but this number can increase. A vaccination campaign is already under way. The neighborhood of Chota is in a high state of alert. It is hoped that it will not reach this part, because it would add another disaster since the river waters that flooded it have not yet receded. Malaria is also an immediate concern. Fifteen days after the cyclone, the stagnant water and the puddles are a great source of incubation for the mosquitos that bring this disease. I professed my temporary Commitment as a Comboni Lay Missionary on 10th May 2015 and now I live as a Comboni Lay Missionary, in the Ministry of Healing. I work in Reach Out Mbuya, an Organization under Mbuya Catholic Parish that provides Holistic Care to People living with HIV/AIDS, Cancer and their individual families. I am a specialized Nursing Officer in Palliative Care working as Clinical Specialist, Trainer, a part-time Palliative Care Facilitator in Makerere University College of Health Sciences, School of Medicine. I love teaching and I enjoy working with adults, children and adolescents/young adults living with HIV/AIDS and Cancer. In them I see full hand of God at work in these young people. What these people want is just a smile and understanding, coupled with a hand touch on them regardless of what their physical condition is like, no wonder the women who had a bleeding for 12 years only said if only I can touch the cloak of Jesus I will get well Mtt. 9:21. We have witnessed people wanting to get blessing from the Pope, Bishop, and Priests and if you are working with the sick, rejected and abandoned, touching them is very great relief to them emotionally. This experience has made me to realise that we are called to discover and reveal God’s love to all and reveal God’s Love for all whose source is in the open heart of Jesus. This requires us to be Contemplative in spirit, generous and educative in mission and passionate for justice, peace and integrity of creation. Jesus is the only one leading us in this journey and this journey is both exciting bewildering to me. I find it very hard to reveal God’s love to someone who has a broken heart, believes God no longer cares for him/her, if so why is it he/she has the incurable disease and the rest of the agony words the patient can pour out. Persisting with such a person and bringing Sacraments such as Crucifix, Statue of Mother Mary, Holy Eucharist and so on to him/her at home, with introduction of praying Rosary by the bed side of the sick person is a wonderful joy I will always remember in my life. Many of these people know they will die soon and so they all want to reconcile their past to God and their families, friends and people who matter in their life. What gives me courage and joy in this challenging Ministry of working with the sick is having faith and believe that I see the face of Jesus in the suffering as St. Mother Teresa of Calcutta tells us during her life on this world, especially tearful faces of the patients and their family members. Some of them have already given up on life as all their hopes are crashed with the terminal sickness to the extend they need help to make a short or long call of nature which makes them totally to depend on their children, leave alone the shame of African/Tribal Cultural beliefs where a child is not supposed to see the nakedness of the biological parent or of a care taker who becomes the real parent to such a child. Taking these people the way they are makes them understand that they still matter to other people and also there are still people who value them despite all their physical disability for daily personal care. 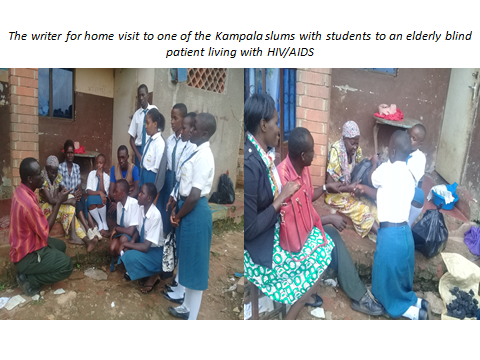 Sign of compassion, students of Missionary Club of St. Kizito Secondary School in Bugolobi Kampala, shocked to see people still living with such a condition in this world, alone in the house, no children, careless person she stays in the same house with. They all cried tears at the site and problem this very poor elderly women is living with HIV/AIDS, they gave all that they had to help her and promise to keep her in their individual prayers. 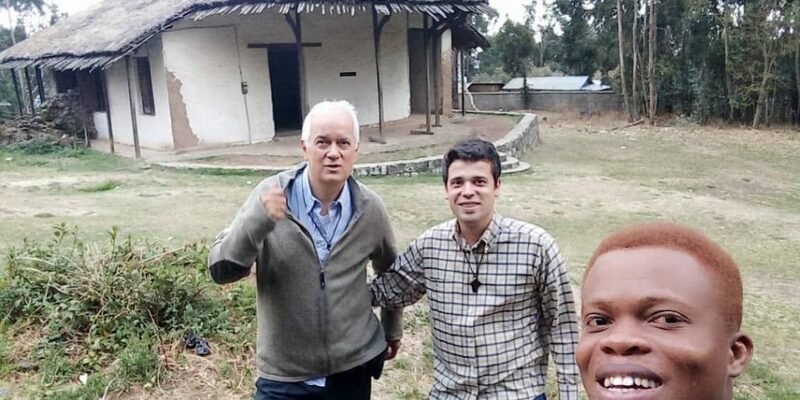 This makes me to believe that in our daily journey as Comboni Lay Missionaries; we need the spirit of creativity, courage and commitment so that God’s immense, tender, strong and merciful Love may shape our future. This we can only be achieved through prayers as Jesus said there is nothing the Father can fail to give us if we put it to God in prayer Mtt. 7:7-12, I also realised this is the only way we can attract more people to our group as they will be touched by the way we care for the sick, abandoned and the needy which is an open way for us to do apostolate in our local communities we live in. You do not need to be a Nurse or a Medical Doctor to visit patients, what they need is only company but not your professional skills. They have over seen medical professionals during their good moments in life and they need only friends, people who can listen to them, talk to them, encourage them and bring them so closer to God at such bed bound state. You don’t even need to think of loading with gifts to take to them, they no longer have appetite for food or your expensive gifts; they only need somebody to sit by their bed side, hold their hand, look them into their own eyes and talk to them as a friend. This will further require us through the moral values and confidence we show to the group through the work we do and how we serve the needy, abandoned according to our Charism of reaching out to the poor and most abandoned as Comboni Family that we value our call and we will do all that can please St. Daniel Comboni so that he can intercede and pray for us from Heaven so that his light will continue to shine through us in this world among the needy people of this world. 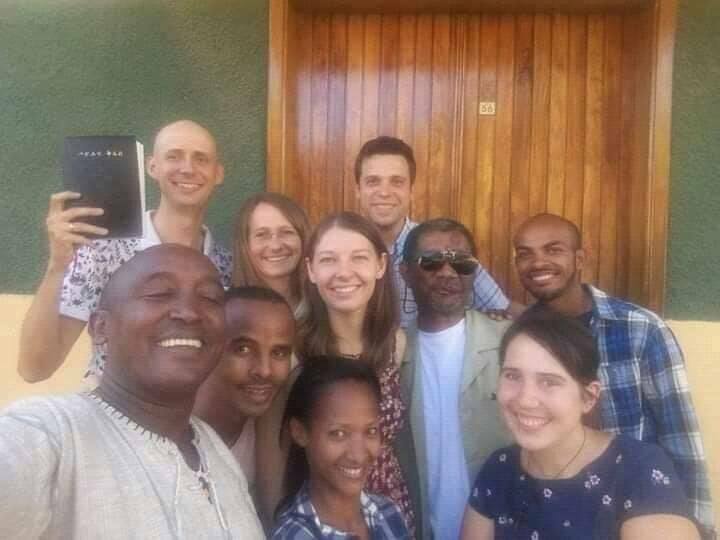 We all have individual gifts, experience that we can use for this call such as our smiles, dreams that we can freely express to the people we interact with on daily basis to bring hope and love for our beloved group as Comboni Lay Missionaries. 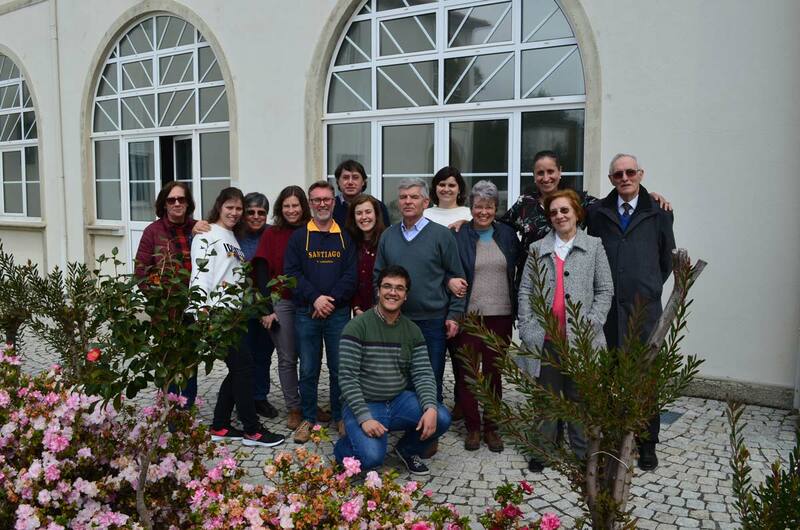 We should always remember that what we do always should promote communion and vitality of CLM in the view of all our missions so that all our actions bind us all as CLM into one big Comboni Family. There are a lot of challenges that we may face in the process of doing our daily work, but interaction with our Spiritual Directors on these holistic challenges we face is helpful and it is very vital that we all have spiritual directors who help us to move with hope, faith, love and courage in all that we do. Inputs in our routine recollections, retreats, daily personal contemplations and sharing experiences with our senior colleagues in the different religious congregations and consecrated people is something that we all may venture into to find out our ability to withstand the wave of the Satan that wants to drift us away from our goal to serve the Lord in the needy we meet every day. Our Satan may not be the snake or that very black something/image we are aware of and not our enemies we know but this can be a person so dear to us in the family or community and so asking for the will of God to be done in our life is paramount just as our Mother Mary said at annunciation Luke 1:38. A story from Japan at the close of World War II illustrates how we might support ourselves and others in transition to the second half of life. If you have ever been to Japan, you will know that its culture is rich in ritual, with a strong sense of the importance of symbol, aesthetics, and ceremony. At the end of the war, some Japanese communities had the wisdom to understand that many of their returning soldiers were not prepared to reenter civil, peaceful society. The veterans’ only identity for their formative years had been as a “loyal soldier” to their country, but now they needed a broader identity. I call this process “discharging your loyal soldier.” As Ken Wilber suggests, we need to “transcend and include” as we grow, recognizing the value of what has come before while shedding old skins and identities that no longer fit us. With tenderness, notice how at various times in your life you’ve fixated on different priorities, different measures of right and wrong, different sources of meaning and belonging. Give thanks for the lessons you learned at each phase that helped you survive, succeed, and become who you are today. Ask yourself what beliefs you may be ready to lay to rest, ways of thinking and acting that no longer serve your maturing awareness of reality. Journal or write a poem. Draw, paint, sculpt, or create a collage. Find a piece of music that illustrates changing moods and move to it. Talk to a friend, spiritual director, or therapist. When we apply this story to our own life as CLM, I strongly belief there are still so many Loyal Soldiers in us that we need our elders like Spiritual Directors and our leaders at all levels to help us discharge. Using the last part of the story, let us ask the Lord to help us to overcome our old self that prohibits our new identity as CLM to express itself in line with the will of God we have committed our self to do.